For South Georgia February was one of the busiest months in the 2009/10 tourist season with sixteen cruise ships and six yachts visiting the island. 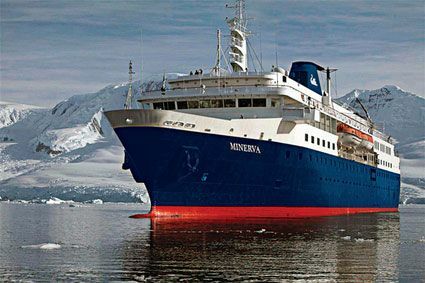 According to the February edition of the South Georgia newsletter the 11th cruise was an especially busy day at Grytviken, with two vessels bringing the largest numbers of passengers in a day this season. “Delphin” with 355 passengers visited in the morning and “Minerva” with 300 in the afternoon. Six yachts have been around the Island this month: three on private visits, two on charter to small tourist groups and one as support yacht to a kayak expedition. Three yachts gathered at the north end of the Island awaiting better weather before launching back to the Falkland Islands. With the weather unrelenting the yachts were trapped long enough for passengers and crew to miss pre-booked flights. One yacht that did head out had a very rough voyage and another 15-metre long yacht ended up having to be singled handed back by the skipper when its two crew members joined a cruise ship to get back for their flights. Continued stormy weather and a wetter than average February disrupted schedules and prevented many landings as the ships sought out the more sheltered potential landing sites on the worst weather days.